In my previous blog post I described a new Tensorflow based Machine Learning model that learns Morse code from annotated audio .WAV files with 8 kHz sample rate. These audio .WAV files contain random words with maximum 5 characters - 5000 samples at each SNR level with 95% used for training and 5% for validation. The Morse speed in each audio sample was randomly selected from 30 WPM or 25 WPM. The training was performed until 5 consecutive epochs did not improve the character error rate. The duration of these training sessions varied from 15 - 45 minutes on Macbook Pro with2.2 GHz Intel Core i7 CPU. I captured and plotted the Character Error Rate (CER) and Signal-to-Noise Ratio (SNR) of each completed training and validation session. 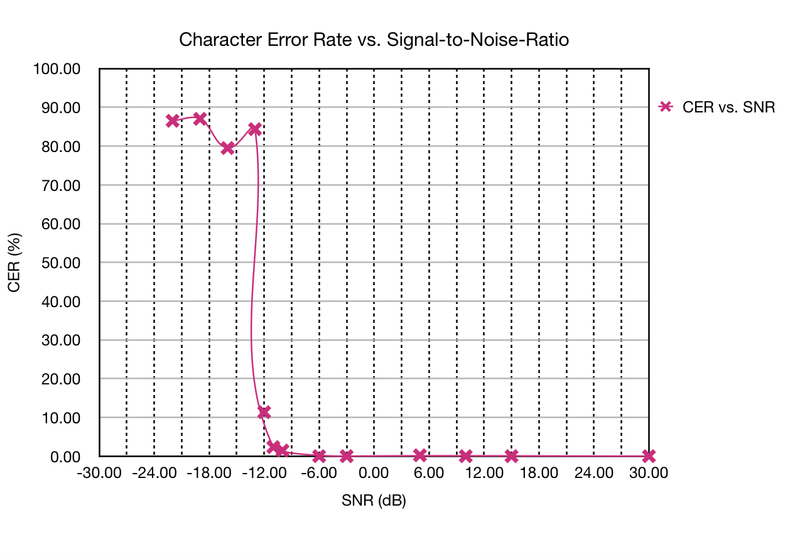 The following graph shows that the Morse decoder performs quite well until about -12 dB SNR level and below that the decoding accuracy drops fairly dramatically. The Tensorflow model appears to perform quite well on decoding noisy audio files, at least when the training set and validation set have the same SNR level. The next experiments could include more variability with a much bigger training dataset that has a combination of different SNR, Morse speed and other variables. The training duration depends on the amount of training data so it can take a while to perform these larger scale experiments on a home computer.